Life is filled with special moments and revelations. Images that burn themselves into our hearts and stick with us through the years. The 2009 NASCAR Whelen Southern Modified Tour season provided one of those moments for me. I’ve shared this story before, but as I was sitting at the keys today reflecting, I wanted to share it again. 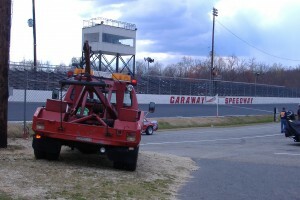 The stage was Caraway Speedway during the second half of our race season. Prior to many of our events, our race community holds an on-track autograph session where fans can come onto the track and walk amidst our field of teams taking pictures, meeting drivers and getting autographs. For me, this was always a great opportunity to connect with family and crew members who are gathered around the cars. Walking through the crowd from car to car, I will never forget the image I saw as I headed towards Brian Loftin’s red hot rod sitting on the front straightaway of Caraway Speedway. Through the windshield of his car I saw his little son, Carson, standing in the seat of the 600 hp beast; he was barely visible over the steering wheel. When I walked up, Carson was standing there tightly gripping the wheel with his small hands. He had his race face on, glaring intently through the front Plexiglas. He was all business. I watched as Carson fixedly pretended he was driving that racecar. His eyes were focused and determined. He was in the zone. Yet, periodically, he would gaze out the side to see if his daddy was watching. Brian was of course all smiles. You could see the pride he had for his son, and the joy he saw in his son trying to be like him. He knew there was no way in the world that he could crank up that machine and wheel it down the racetrack. But he knew where Carson’s heart was. That image burned the reminder into my mind that we don’t have to be like Daddy to get in the car to race. I think that following God can be intimidating to many of us. We can hardly make it through the day without messing something up, how are we to be able to attach ourselves to a holy God? We don’t say the right things. We don’t do the right things. We can’t love others. We just aren’t able to live like a Christian should live. So we choose to stay out of the race. Yet, I think God wants us to see us slide behind the wheel anyway. Over the years Carson is going to grow and mature, but right now he just needs the attitude of “I want to be like you”. Through our life we will grow and mature in Christ…but in the beginning He is not looking for what we can do, He is looking for a heart that says I want to be like you. James 4:8 tells us to draw near to God, and He will draw near to us. I don’t know about you, but I want to drop the window net, slip into the seat, put on the steering wheel and say God, I am ready to go…I want to be like you.